You might be wondering why we made a pound cake with peaches in it in October, instead of something normal and seasonal like apple pie. Well, we’ve had some chopped peaches that our grandmother froze for us about a month ago, when the peaches were getting overripe. Finally we had a chance to pull the peaches out of the freezer and use them in something! To prevent the peaches from releasing too many juices into the cake, we thawed and drained them first. The recipe then calls for dusting them in flour to prevent them from sinking. 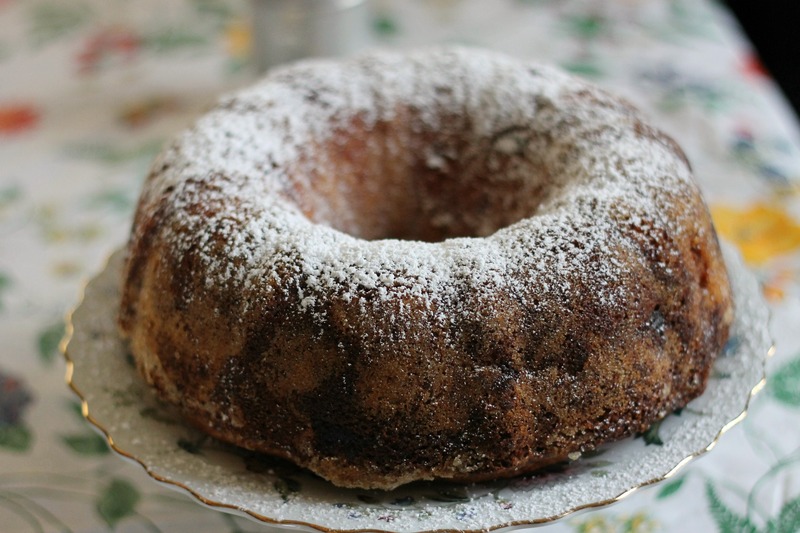 What you are left with is a perfectly moist pound cake with a peach chunks throughout. So, if you somehow managed to find some decent fresh peaches at this time of year, use them and this cake will be great. If you want to buy frozen peaches at the supermarket, this cake will be equally great! 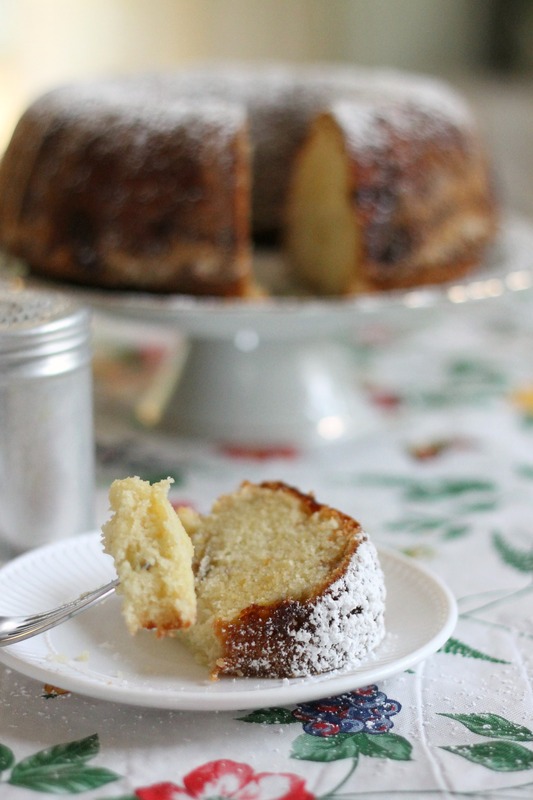 It’s truly one of the best pound cakes ever! P.S. We only had just 2 cups of peaches. The original recipe called for 2 cups, but Annie’s Eats did recommend adding in more. So, in the recipe below, we have it marked for 2 1/2 cups of peaches. We felt that all this cake needed were just a few more peaches! Preheat oven to 350 degrees. Grease a 10-inch Bundt pan with 2 tablespoons of butter and dust with 1/4 cup of sugar; set aside. Using an electric mixer, cream together remaining butter and sugar. Add vanilla, and then add eggs, 1 at a time. Gradually add the flour, baking powder, and salt and mix until fully incorporated. Fold in peaches. Pour into prepared pan and bake for 70 minutes until golden brown and a toothpick inserted comes out clean. Let cool in pan for 15 minutes, then invert onto a cooling rack to cool fully. When serving, dust with powdered sugar. Enjoy!